I recently developed a prototype music keyboard for the iPad, in order to play around with the idea. 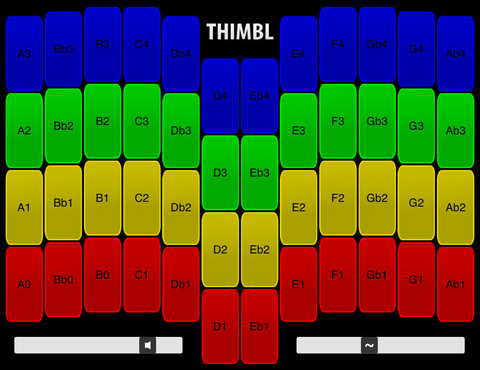 It’s called the THIMBL Keyboard and it looks like this. Each octave-row maps the twelve semitones to six positions on each hand: Thumb, Half (between Thumb and Index), Index, Middle, Big (ring finger), and Little, thus the THIMBL acronym. This keyboard is very interesting because it has no diatonic bias like a standard piano keyboard, but it does have a bias toward certain keys, i.e. the Left Index position is always a C note. The player moves up and down octaves by moving the hands vertically, so chord inversions are very easy to find. However, this layout means that a C Major scale is not especially simple to play without knowing the right sequence of steps, or memorizing finger positions. I’ve been practicing some basic technique with this prototype, and have discovered a few things about how it behaves. It seems unorthodox at first, but after learning the intervals between each pair of finger positions, playing music by ear becomes much easier. There are some expected problems with touchscreen controls, as the fingers can’t rest on the key surfaces, and the keys don’t overlap in tiers, but in general this prototype is more durable and easier to maintain than the last version. I’d still like to build a production-quality model but this works surprisingly well in the meantime. Check it out if you’re interested! I’ve also put together some vertically-oriented notation paper which helps with transcribing and playing music. 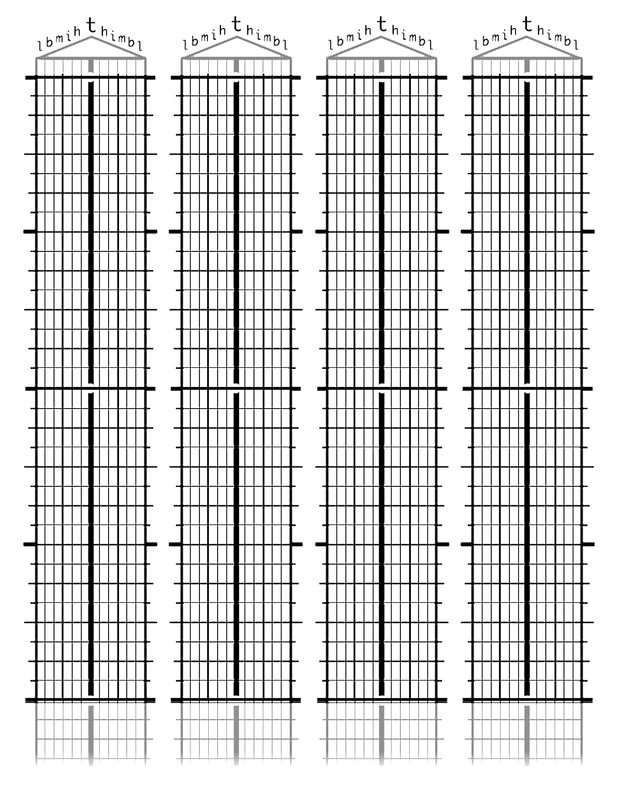 Time is measured in rows and finger positions correspond to columns of cells. You’ll have to find some way to indicate the octave of each note in this grid, I’d recommend color-coding notes to match the octave colors on the keyboard.